It was a beautiful autumn day in Red Lion, PA, where I had the privilege of working with wonderful teachers and their children in grades 3-6 today. 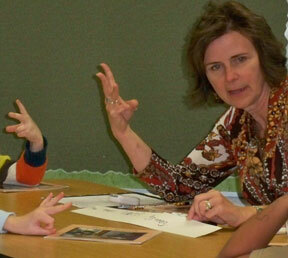 The school was Pleasant View Elementary; the topic was guided reading. It was my favorite kind of day– the kind where I work with kids! The teachers and I worked together choosing a lesson focus, picking a text that was just right for the students, and planning a guided reading lesson. Then I taught the students in a small group while teachers observed, and we ended with debriefing– reflecting on the lesson and what both we and the children learned. I got to teach three very different small groups today. 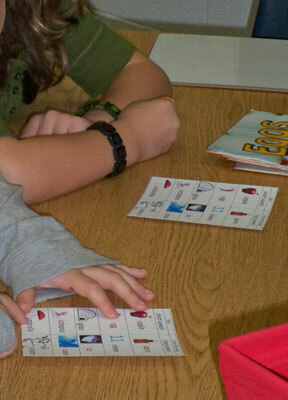 We had a 3rd grade above-level reading group that read very well, but sometimes skipped words they’d never seen before. To guide them, we chose a text from the Internet about hamsters. Their class is getting a hamster, and the nonfiction text we chose was about getting a home for your hamster. I showed students in this group how to highlight a new word they’d not seen before. (We used a highlighter pen, since they had a text printed from the Internet.) Then I showed them how to look carefully at the new word (usually a long word) and find the parts they know, covering up each part with their fingers after they’d read it, and then blending the parts together, using their fingers as needed. I modeled with a dry erase board and a few new words, as pictured. They helped me circle parts they knew. When they began reading the article on their own, at first, some of them thought they knew all the words; but with guidance, they began highlighting words and trying to put the parts together. Their teacher told me that she was thinking that vocabulary was their need, but today she realized that both decoding and vocabulary were important for this group to focus on. The Pleasant View Crew- fabulous teachers!